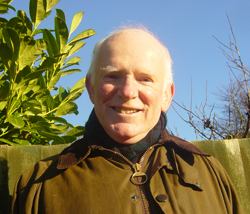 Alan Barber is an advocate, activist, and critic who has worked tirelessly on behalf of Britain’s public parks and greenspaces for decades. Barber’s efforts at all levels – within communities, through university teaching, and in local and national government positions – has made real and lasting change in how public parks are managed and prioritized in the United Kingdom. Barber is unfailingly passionate and unafraid to speak his mind. His recent appointment as a member of the Order of the British Empire stands in testament to his years of devotion and commitment to Britain’s public parks. Alan Barber was born in Lancashire, UK, in 1942. His love of greenspace was cultivated at an early age; he apprenticed with a local parks department at age 16, and at 21 he began a two-year term of study at the Royal Botanic Gardens at Kew. Throughout the rest of his twenties, Barber learned about parks management by working “on the ground” jobs in Lancashire and Manchester. Barber then became Parks Manager for the city of Bristol, UK. Working in this position, he came to hold many of his current positions on parks management and the role of parks in urban social life. In this role, he founded important and lasting public-private partnerships, increased parks programming, and introduced goal-based management systems imported from industry. Barber repeatedly witnessed budget cuts leading to the ruin of parks programs and historic greenspaces, which inspired him to begin campaigning and consulting nationally for dedicated parks funding and management. In this role, he served as President of the Institute of Leisure and Amenity Management. In 1996, Barber co-wrote a position paper for Lord Rothschild that spurred the creation of a new grant-making parks initiative, funded by the national lottery, that became the largest investment in public parks in the UK; to date, over £300 million has been invested in revitalizing public greenspaces. Barber then went on to help found GreenSpace, a charity devoted to improving parks and involving communities in their care. He has also held several advocacy and teaching positions within government and universities, all devoted to better parks management and preservation. In 1998, a House of Commons Select Committee – akin to a Congressional investigative hearing – met to consider the plight of public parks in the UK. Barber, who considered this a “real breakthrough,” served as a special advisor to the inquiry, and later to the government Urban Green Spaces Taskforce formed as a result. Barber helped to persuade both these bodies of the need for a national agency devoted to parks issues; in 2003, CABE Space – an addition to the UK’s Commission for Architecture and the Built Environment (CABE) – was formed, and Barber was appointed a member of the Commission. The Role(s) and Management of Greenspace. Barber sees public parks and greenspaces as inherently multifunctional, and believes that their management must (but too often doesn’t) acknowledge this characteristic. He views parks as part of a larger ecological, cultural, social, and educational system. This understanding of parks’ multifunctionality led to Barber’s CLERE model for parks management, which highlights five key interrelated roles of urban greenspace: (1) Community development and education; (2) Landscape with conservation requirements; (3) Ecosystem that provides natural services to a city; (4) Recreation resource; and (5) Local economy contributor. Each of these functions implies an accompanying set of management issues and goals, all of which must be addressed holistically for the greenspace to achieve its fullest potential. The proper management of urban greenspace has farther-reaching benefits, as well. It contributes positively to national and global problems, including environmental issues like climate change and air quality, human well-being, and economic prosperity. Moreover, quality public space fosters and supports civic engagement and community spirit. If citizens feel alienated from their public spaces and institutions, they are less likely to participate (formally or informally) in governance of their communities. Thus, careful stewardship of public space is integral for guaranteeing meaningful democratic participation. This is a cyclical pattern: the less democratic the governing bodies, the more institutionally dysfunctional, bureaucratic, and self-interested the government – and in turn, a government of this sort won’t be a good steward of green space. Design and Management. Barber seeks a closer, more collaborative working relationship between designers and managers of public spaces, believing that design too often occurs without consideration of how people will actually use the space. Parks, in particular, must be well-maintained and well-programmed in order to live up to their potential as great public spaces. He says: “Design and management have to be brought much closer together. I have found good design solutions to management problems but only where designers and managers speak the same language and where they can both communicate with people.” Good management gives public parks the ability to adapt in response to changing user needs. Fixed architectural elements are not easily adaptable and are “incapable of self-renewal,” in Barber’s words; however, parks can be continuously renewed when managers intervene in an informed, thoughtful, and publicly-minded manner. “People-Power.” Instead of relying on government to make necessary changes to public space, Barber puts his faith in grassroots “people-power” movements. He notes the importance of local community groups (often “friends of the parks” organizations) in influencing the political agenda and engaging with public space. Barber also extols tools like PPS’s Place Game and CABE’s Spaceshaper, both of which involve communities in critically appraising their own local spaces. "Campaigning for better public parks is my life and I don't intend to stop until I collapse in a heap.